Creating commissions– art works that a person or group pays you to do specifically for them– can be extremely rewarding in that they provide an opportunity to make someone really happy– if you can manage to fully understand what exactly they want. But... it’s all about communication! You may be surprised at how many non-artist folks have really concrete ideas of art works they want, but they either can’t find them in galleries or they don’t have the first clue (or perhaps the ability) to create them for themselves. Other times, people know they fancy some new art, but they’re really not sure exactly what it is they want. Even those with a fully developed concept may not be great at communicating their vision. That’s why, if you want to be an artist who successfully does commissions, you can’t just be good at drawing, painting, etc. It’s imperative that you are also a great listener. But, sometimes you also have to be an excellent interviewer, because the client may not be forthcoming with information. The following are tips for establishing a great relationship with a commission client, facilitating effective communication and maintaining that successful rapport, from your initial interview with them to the point when you're seeing their Venmo payment in your account. 1. Be a great interviewer. Set aside time to meet with the client in person to discuss what it is they desire in the art piece. I think the best place to conduct this “interview” is in their home. It allows you to see their surroundings and get a sense of the colors they like, their personal style and the space they have available for the art piece. Pay attention to their home. You may notice there’s no purple at all. Ask them about that. Do they dislike purple? Perhaps they don’t care for that color, but they weren’t aware of that preference. In either case, you'll likely want to avoid that color in their piece. I’m fortunate in that, as a journalist, I’ve interviewed hundreds of people. I’m very comfortable with it. And it's become a really valuable tool for me with commissions. It may not seem natural at first, and you might feel as though you’re annoying them with so many questions, but, in the long run, it will pay off, because the more you know, the better you will be able to realize their vision. Don’t try to be a mind-reader. Don’t assume. Ask questions. And don’t forget to bring pen and paper with which to take notes, or a recording device to capture the interview for later. These notes or recordings will be very important when you work on the project. 2. Clearly establish the size, style, price and deadline. Be very clear in all of these elements before you put down the first brush stroke or pencil mark. Ask about what styles they like. Have they seen your work on your website or Instagram? What is it they like about your work? What other artists’ work do they admire and why? What types of things do they not care for? Talk a lot about the style of the commission piece before you begin it, so that you’re well prepared to give the client what they are paying you for. If you haven’t already determined the price, figure out what would be fair/acceptable to you based on how much work will go into the commission, how large or small it will be and the time frame in which you have to work. That last element should also be determined before you begin, so that you have sufficient time to create the piece, but also to ensure the piece is ready by a particular date that might be important to the client. Perhaps it will be a wedding or birthday gift. Maybe they want the piece by the time they move into a new home. Be clear on this time frame, and meet that deadline! Some artists don’t like to share work-in-progress shots. They feel vulnerable to others seeing the stages of their work. This can indeed be a bit unsettling, but, if you want to be successful at commissions, you have to set that feeling of vulnerability aside and, as you work on the piece, share with the client the progress you are making. Of course, the answer to that is “yes” and you'll find out exactly how they want the clouds, which brings us to number 4. 4. Leave your ego behind. There may be times when the client seems to be especially critical of your work. You may begin to wonder why they commissioned you in the first place. Do not take it to heart. Try to remember that they chose YOU for a reason. They love your work. They believe in you. So, when they point out things they don’t like, don’t take it personally. Think of the client as being on your team; you’re both trying to make sure the end product is one you’re both happy with. Also, bear in mind that an art commission is a big purchase for some people. Even if it’s not a financial strain for them to commission you, it will be an art piece that, for years, will be displayed in their home. Do your best to give them something of which they can be proud to show their guests. Throughout the process, let them know that it is your goal to make them happy. I tell my commission clients that I am merely the conduit for them to use to get their vision onto canvas. But I also let them know it’s their “job” to make sure I have all the information I need. I also tell them that I’m more than happy to make any adjustment along the way. 6. Upon delivery, be open to more modifications. For a recent commission, when I delivered the painting to the client's house, I brought along all the paints I'd been using, brushes, a jar, a palette, drop cloths and all reference materials I'd used. I told the client ahead of time that I was doing so. That way, he was able to plan time to be home with me while I made any last-minute adjustments he'd wanted, of which there were a few. I ended up being at his house for about two hours, working on a few different areas of the painting. It was helpful having him directly involved in those final steps too! And I think it gave him a sense of inclusion within the process. 7. If you enjoyed working with the client, let them know. Tell them to feel free to share your contact info with friends or relatives who compliment their new art work. And let the client know you're available to do more when they're ready. Since you're already familiar with each other, the second time around will be much easier. Cory Bilicko is a professional artist living in the Los Angeles area. He has created numerous commissions, including several for "repeat" customers. To commission Cory, you can reach him at (562) 208-1904 or scribeandsketcher@gmail.com. Cory Bilicko is a professional artist living in the Los Angeles area. 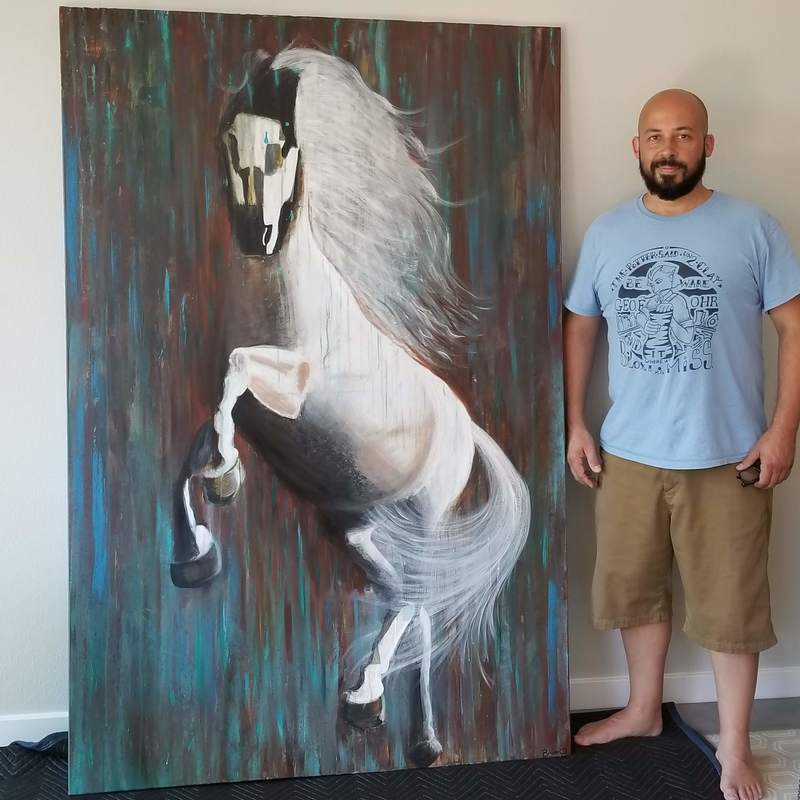 He has created numerous commissions, including several for "repeat" customers.